Good News for Chandigarh Tricity !! Taking out time to go to the beauty salon is now a thing of the past. I introduce you to MyGlamm - a mobile app for on-demand salon services at your doorstep. Frankly, for the lazybones like me, the concept of home salon services is a boon. Why? Because most of the times, it hinders me to get myself indulge into some self-pampering when I cannot spare a few hours of travel to a GOOD salon in the city. MyGlamm brings to you a range of premium salon and spa services right at the comfort of your home. 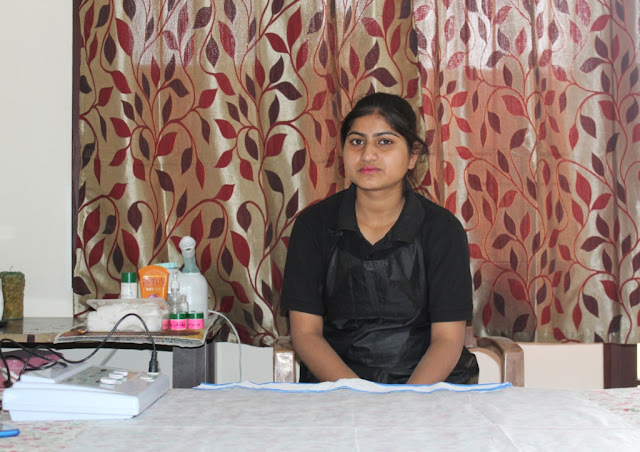 They not only offer basic grooming like waxing, threading, facials, manicures and pedicures, but lets you avail more elaborate services like bridal makeovers, nail extensions, scalp treatments & relaxing spas without stepping out of your home. They use premium and professional products like Forest Essentials, Christine Valmy, L’Oreal, MAC and MoroccanOil to make sure you enjoy best-in-class services. The MyGlamm artists go through intensive training and strict background checks before being hired, that means they are skilled in their job. MyGlamm had been extending its services in Bangalore, Chennai, Delhi, Gurgaon, Indore, Mumbai, Pune, Udaipur, Jaipur since long and recently made a debut at Chandigarh. So I decided to have a one-to-one experience with the salon and today, after taking two consecutive sessions with them in a fortnight, I'm ready with my review on the services. In my first session, I booked for a Detan pack and L'Oreal Hair Spa. The artists (Duvij and Reema) arrived at my place about half an hour late due to extremely bad weather, but gave me a prior intimation over the phone that I really appreciate. As soon as they arrived, they looked for the suitable place to make me seated comfortably and we chose the dining area due to proper lighting, table setup and closest electric point to plug-in their appliances. The floor under my chair was covered with water-proof tarpaulin sheet before the process began. The products to be used in the services were nicely laid on the table including fresh disposable sheets and gown. The hair spa was given to me by the male artist, while the female did my Detan service. It shows the salon makes sure that the clients don't feel uncomfortable while taking certain service by male artists. The hair spa involved four essentials steps in the process - Shampoo, conditioning, hair mask and massage. But I was asked to rinse my hair thoroughly since I had washed my hair day before. The products used during the spa came from L'Oreal range only. 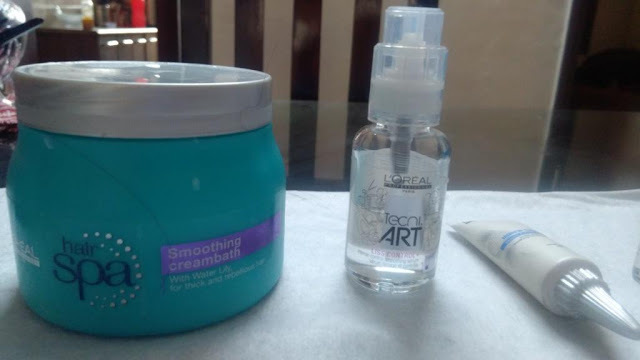 The head massage with Smoothing Creambath not only made my hair smell beautiful, but provided essential nutrients for the good health of my tresses. I liked the concept of carrying portable appliances along, just like the one that was used to give steam to my scalp. The Techni Art Liss Control serum and Inner Spa Scalp Treatment worked magical to control my unruly hair and keep them in place after I rinsed my hair. During the service, the artist kept on advising me with further more tips that I should/shouldn't follow to improve condition of my hair better. Great work!! 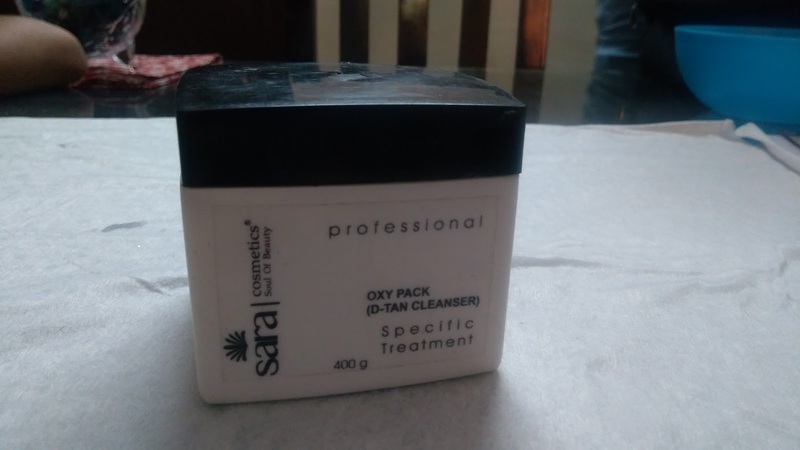 For the Detan service, just a treatment pack was used from brand Sara Cosmetics that had been a new name for me ;) But later I discovered that it's an organic product range. The pack gave a cooling sensation when on skin. The goodness of camphor and eucalyptus oil in the pack cleansed my skin and provided visible change on skin. After a satisfactory experience, I decided to go for another session in which I chose to take Forest Essentials Advance Facial. Artist Jyoti arrived with her bagful of items and set everything on the table next to my bed. The facial began with cleansing followed by exfoliating. Jyoti recommended not to use steam on my for the fear of aggravating skin dryness and I agreed. 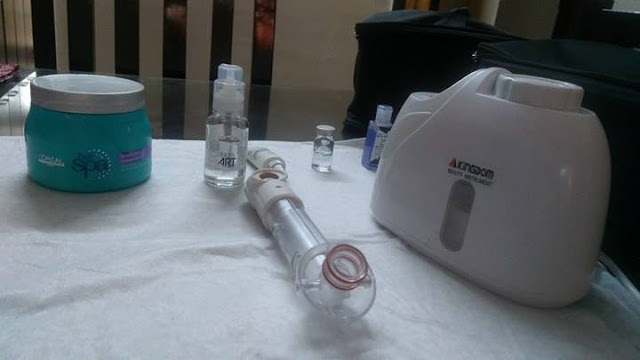 The Advance facial not only involved manual massage, but the artist used an ultrasound machine on my face so that the product penetrates deeply into skin. The lady had been really polite and inquired me frequently if her hand-pressure had been convenient to me during massage. I thoroughly enjoyed the back massage towards the end of process that relieved my aching muscles. My skin looked and felt supple n invigorated after the facial treatment. 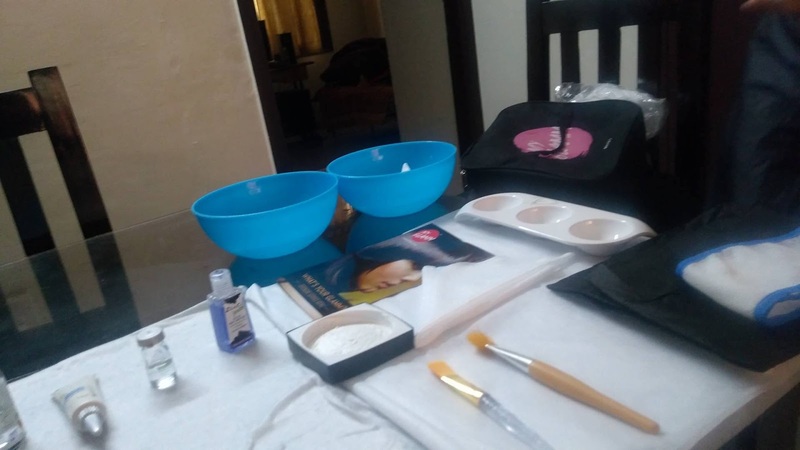 Based my experience, I would say MyGlamm is doing wonderful job delivering an entire gamut of beauty services by trained therapists using branded products & serving you with a hygienic salon experience at the safe environment of your home. So, if you too are looking forward to pamper yourself with much-needed makeover or relaxing massage, I strongly recommend utilizing a service with them. You may book an appointment either via a phone call on toll free number 1800-103-1516 or using mobile app available on Android and iOS. To avail a FREE service from MyGlamm, head to my Instagram and check out the contest post. One winner will be randomly selected. Contest wraps up in two days. The winner name is announced on the contest post on Instagram. wow this looks like a amazing pampering time :) nice to see this on a Monday takes awa blues. What a neat service! It's so interesting that they used an ultrasound machine for the facial. Boy what a great experience for you to be able to try all of those services! I don't believe this is available in the United States is it? Ahh! Taking a spa day sounds like exactly what I need in life right now. Hope you had a wonderful time and the massage was relaxing! I love the idea of a spa day in your own home! Glad you enjoyed this service! This is the perfect app for me. I love having spa days with my friends. Now I don't have to plan them myself. This is great. It is the first time I have heard of this and I will check to see if it is in my area. What a perfect app for some home pampering! It will not only save time but you can have your spa day at home whenever you want! What a great contest and I love the idea of having this service available at home. When you have little ones with you all day, leaving the house becomes a challenge.